Spain has been at the culinary forefront of world cuisine for decades now. So, among all of the famous Spanish chefs, among the myriad destination restaurants topping the "World's Best" lists, and all of the avant garde theory behind elevated regional Spanish cuisine (not to mention the headline-yielding political divide between the various regions of this Iberian country of late), it seems strange that the closest thing to a national dish would be a plateful of fried potatoes. Yet, this popular (and populist) tapa, this essential Spanish bar food, is generally considered just that. Beloved by everyone from the poorest of university students to the most lauded chefs in the land, patatas bravas are the one dish everybody in Spain loves. Its simplicity of presentation belies both the complexity of flavor of the dish, and the thoughtful preparation required to achieve the perfect patatas (or papas) bravas. As for the first element, one can argue (and Spaniards do) about what variety of local potato they feel is best for this dish. There's even a potato museum in Madrid if you're looking for historical context and more background information than you'll ever need to happily consume a potato. But no matter, the generally-accepted process is to blanche (or par-boil) the potato first, then dry it and fry it. Some fry it twice, as is done with french fries. Some, like chef Marc Roca at his Barcelona eatery Blau BCN, don't fry the potatoes at all, and instead boil them but make the sauce the interesting textural counterpoint in the dish. It's not traditional bar food patatas bravas, but it is delicious, doused in a smoked paprika and tomato-based sauce and topped with tons of fresh allioli. 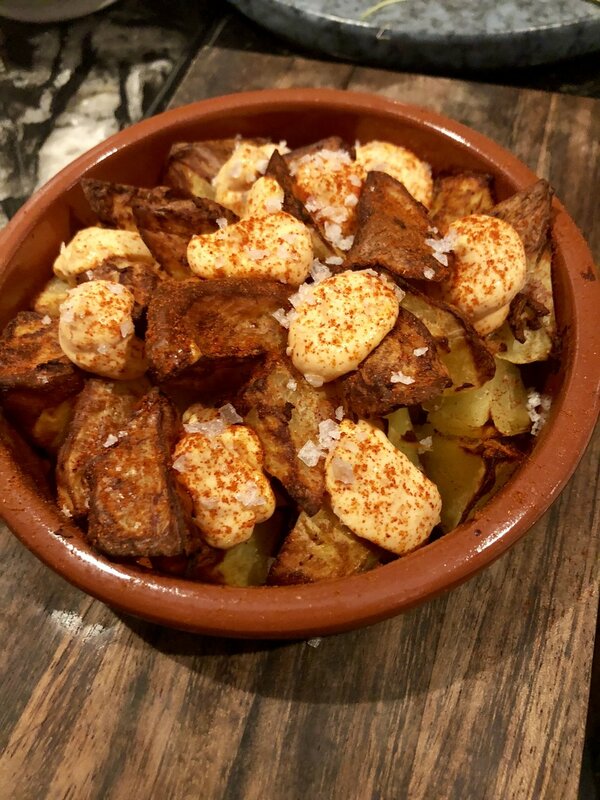 Still, the frying of cubed, irregularly-cut potatoes is what makes these such a tapas bar staple. You can stick them with a fork or a toothpick and share a plate easily with your eating companions. As for the sauces, here the regional variances come into play. Element #2 is the (usually) spicy, (usually) red sauce. Generally speaking, it's some combination of tomato sauce, vinegar, paprika, and a hot sauce like Tabasco, along with any random spices (black pepper, cumin, cayenne, etc.) the preparer likes to add to enhance the sauce's flavor (if at all). It is said that this piquant sauce has basque roots. We know one thing for sure: a true spicy sauce for patatas bravas cannot be ketchup. Period. The allioli (ay-OH-lee), the Catalan word for a garlic mayonnaise, is the other key sauce. In Catalonia they often forego the egg in making this white sauce, though egg certainly acts as a binder and makes the allioli fluffier. These are some of the many modifications one might make in creating an allioli. 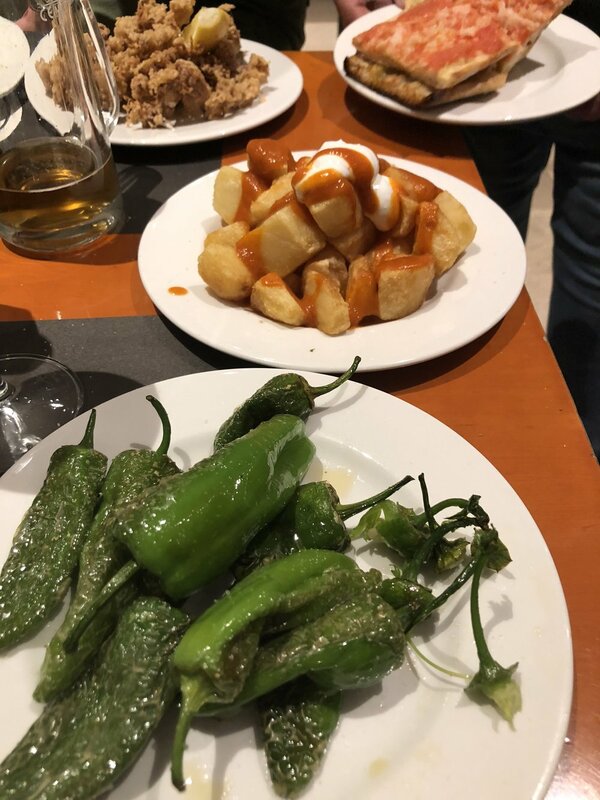 There are certainly many variations on the aliioli itself: black garlic, smoked paprika allioli, lemon allioli, truffle allioli -- just a few of countless possibilities and among those I've tried on patatas bravas. Net-net? They're all good. It's garlic mayo, at the end of the day, so we're looking at a very high baseline deliciousness quotient! The beauty is in the melding of all of the flavors, and these flavors are best absorbed by a hot potato. Think of the potato itself as a malleable base, a blank canvas on which you can pour other layers of delicious flavor. To me, a perfectly fried potato is a textural dream, already the holy food trinity of potato, fat, and salt. So adding spice and creaminess with the kick of garlic on top of it? Perfection, any way you look at it.